Free Download Intelliscore Polyphonic WAV to MIDI Converter 7.1 - MIDI converter for single instrument music. FROM: Innovative Music Systems, Inc.
WAV to MIDI, MP3 to MIDI, CD to MIDI, WMA to MIDI converter to transcribe music. Intelliscore Polyphonic WAV to MIDI Converter is a MP3 to MIDI converter that helps you figure out the notes (their duration and dynamics, tempo changes), chord names, and the key of pre-recorded or live performed music. The automatic music recognition software can convert MP3 to MIDI, WAV to MIDI, WMA to MIDI, CD to MIDI. It also supports AAC and AIFF formats frequently used in Apple products. 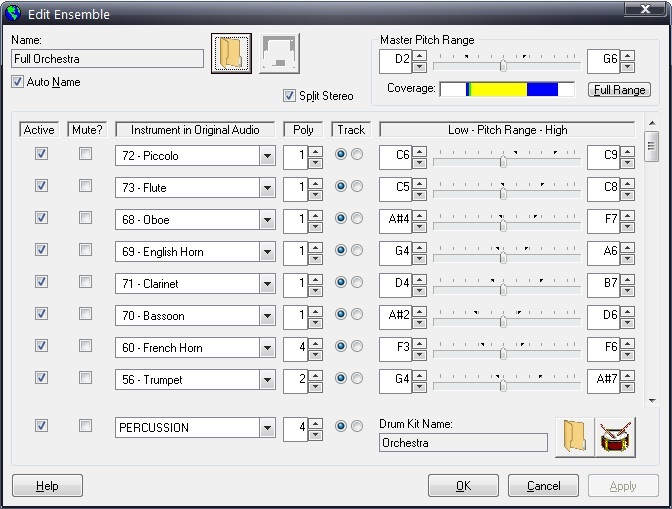 The Polyphonic edition of Intelliscore Converter is limited to converting music with only one instrument played polyphonically or monophonically and without percussion. IntelliScore uses various complex conversion algorithms based on research in psycho-acoustic physics and automatically determines distortion and volume levels of audio files to help ensure the best conversions. Project Wizard will guide you through the process of generating MIDI to produce the most accurate conversion results in the shortest amount of time. The tool allows to adjust such advanced settings as output threshold, polyphony, pitch range and timing resolution, etc. After IntelliScore has converted your audio to MIDI, you will know if it is major or minor key, its overall tuning, estimated tempo and meter (time signature). You can do the following with your converted MIDI file: play the source audio file and the MIDI file together in the SyncPlayer to evaluate the conversion result; convert again if the result is unsatisfying, modify some settings and save your project settings for future use; open the MIDI file in your MIDI editing software to edit and convert it to music notation and print it out. When converting monophonic audio, intelliScore can accurately track expressive changes in volume, pitch, and brightness, recreating such effects as pitch bend, vibrato, tremolo, and portamento. IntelliScore is designed for musicians and music teachers who work with sheet music or MIDI files. IntelliScore allows you to spend more time making music instead of figuring out notes. Review Intelliscore Polyphonic WAV to MIDI Converter! Intelliscore Polyphonic WAV to MIDI Converter 7.1 - WAV to MIDI, MP3 to MIDI, CD to MIDI, WMA to MIDI converter to transcribe music.